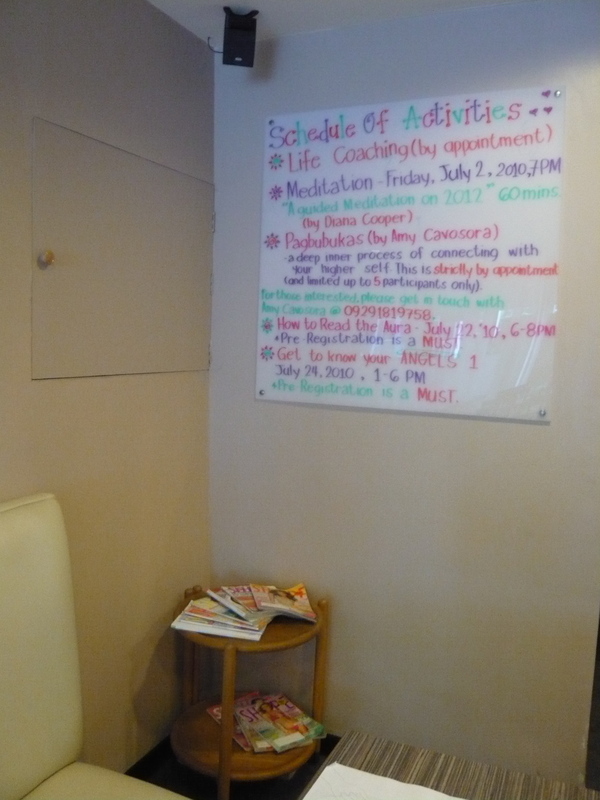 Atienza, who runs The Singapore School in Manila, and Bagatsing, who is a life coach and teacher, take the concept of eating and growing in gratitude by holding free workshops on the second floor of their café so those who are interested to get to know their inner angel, learn about meditation or just want to amp up their inner health are more than welcome to sign up. The partners also apply scientist and author Masauro Emoto’s philosophy when it comes to serving their food and beverages. Emoto’s breakthrough book The Hidden Messages in Water explains how placing positive words on containers of water actually transforms its energy, and he documents this by photographs of frozen water crystals — the more positive the word, the more beautiful formation of the crystal, the most beautiful of which belonged to the one that had the words “gratitude” and “love” attached to it. 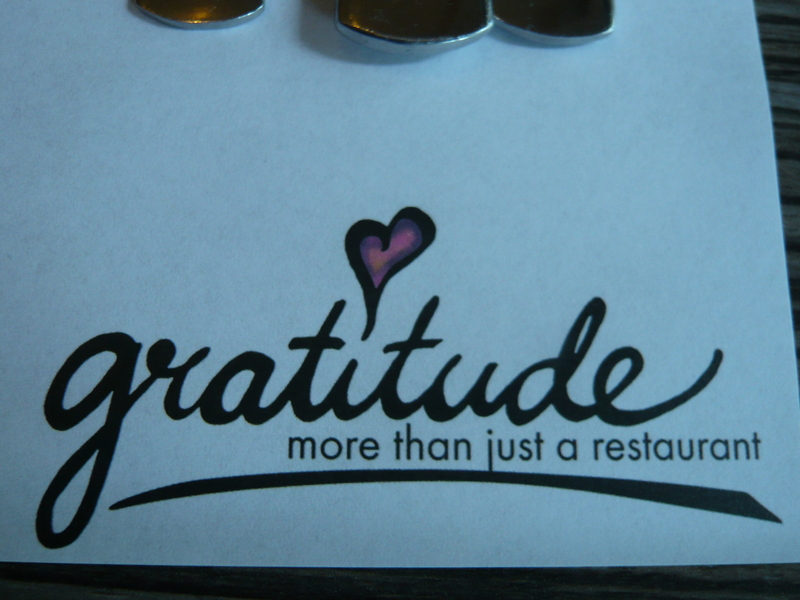 Each and every plate and glass has those words, not to mention the attitude of gratitude etched in. 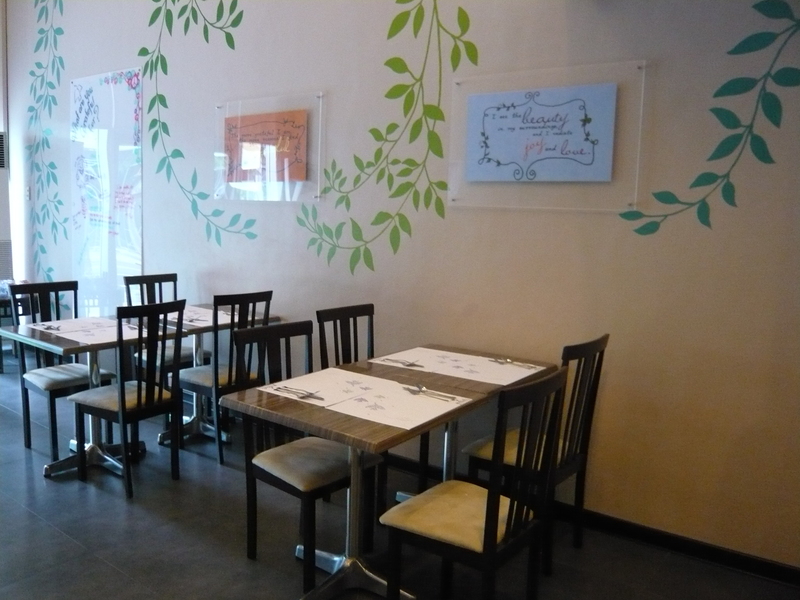 Dining is a full-on interactive experience, so feel free to write on the “gratitude” wall all the things you are grateful for. “Why Gratitude?” explains Bagatsing. “Because we want to remind people that there is so much to be grateful for and there is always something to be grateful for; those who lead a life of gratitude live happier lives.” As you order, you are also asked to choose a rolled up paper from a big glass bowl, sort of like a reverse fortune cookie, which instead of telling the future actually brings you back to the present with an affirmation. Mine that day read “I attract only loving and uplifting people into my life.” Suffice to say it resonated so perfectly with what I was being challenged with that day that my spirits were instantly lifted and I have kept that piece of paper in my wallet ever since. “It’s interesting to watch people as they enter and how they react to their affirmation for the day,” chuckles Bagatsing. “Some enter with somber or serious expressions and then they read their affirmation and their faces and energy just change. I’ve even heard some laugh out loud.” Probably because what they read was exactly what they needed for a little jolt of joy. 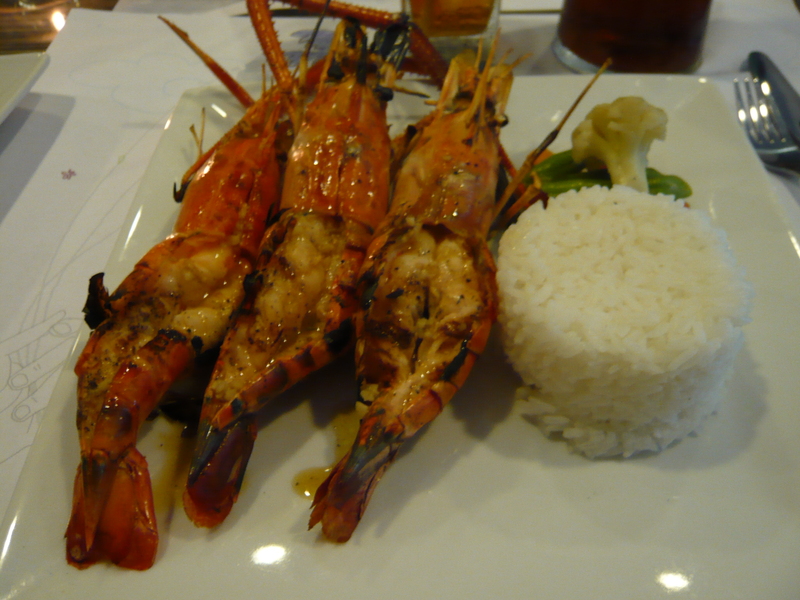 There is a generous selection for vegetarians and non-vegetarians, from the adobo with gluten bits to my dish delight of the day — the “I Am Worth It” — which was grilled shrimps that were lightly buttered and served with rice and vegetables. 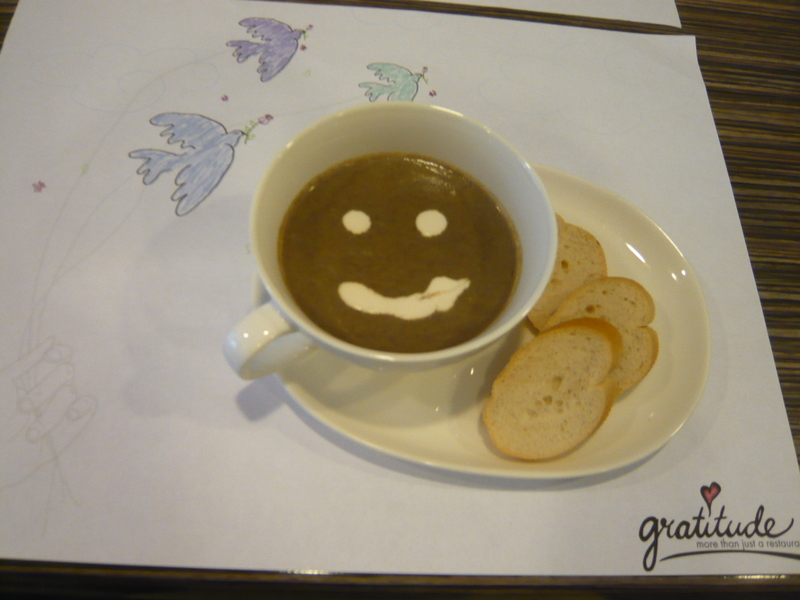 You can also have the “I Am Delightful” lentil soup that is served with a smiley face. Food that is actually happy to be eaten makes the dining experience even more… well, delightful. If you are trying to watch your weight, then you will appreciate the calorie count, protein and fat percentages indicated at the bottom of each dish, so every choice you make is done with full eating awareness. In other words, it’s a very grown-up kind of restaurant that attempts to remind you that everything you do is a choice, especially what you put inside of you. Perhaps one day you may want to pop by to cool your heels and read a good book (there is a small but growing library) or be in the company of loving and uplifting people as you sip your honey-sweetened “I am charming” iced tea. You certainly deserve it. 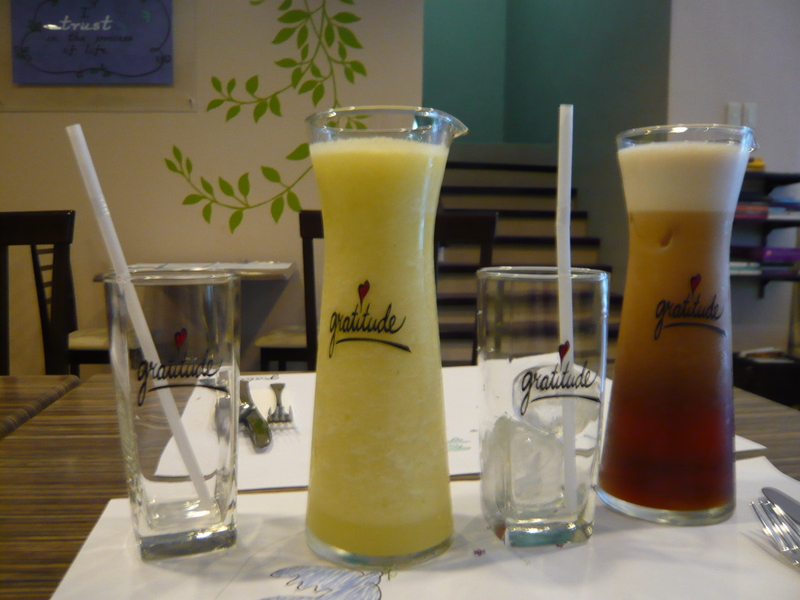 * * * Gratitude Café is located at the ground floor of Sapphire Residences, 2nd Avenue corner 31st Street, Fort Bonifacio Global City, Taguig. Open from 11 a.m. to 11 p.m., Mondays to Saturdays. Tel no. 519-1725.